Israeli Occupation Forces invade and raid Nabi Saleh; 6 injured. IOF invaded and raided Nabi Saleh today, injuring 6 people with one person hospitalised. IOF began firing live ammunition near the tower at the entrance of the village and then invaded the village firing teargas into houses. Manal Tamimi has reported her family has had to leave her house because it is filled with teargas. Wa’ed Tamimi, the son of Nariman and Bassem Tamimi, was hit in the head with a rubber coated steel bullet fired by Israeli Occupation Forces (IOF). Wa’ed was been evacuated to hospital after collapsing due to dizzyness caused by the head injury. Doctors later stated that his injuries were not life threatening and that he would be okay. According to Manal Tamimi, at least 6 people have been injured as the IOF invade and raid the village. In the last five days in row, Israeli army has been raiding Nabi Saleh every evening just before Iftar. Yesterday, large force of military raided the village, clashed with the residents while shooting live ammunition, searching houses and assaulting residents. Large military force raided yesterday evening the village of Nabi Saleh and clashed with citizens while shooting live ammunition. This is the fifth day in row, the army raids the village just before the Ramadan meal to break the fast (Iftar). The soldiers raided several houses without warrants, terrorized families and children, who were preparing to break their fast. Soldiers also beat residents, including 9 years old child. Another young man who was visiting one of the village’s houses, was beaten brutally by the soldiers and subsequently hospitalized, while suffering from internal bleeding. In addition soldiers shot large amounts of tear gas canisters and sound bombs. Abd Alrazeq Tamimi (father of martyr Mustafa Tamimi who was shot dead last year in Nabi Saleh), who suffers from kidney failure, fainted after inhaling tear gas shot by soldiers to his house,and was taken to Salfit hospital. Background Late in 2009, settlers began gradually taking over Ein al-Qaws (the Bow Spring), which rests on lands belonging to Bashir Tamimi, the head of the Nabi Saleh village council. The settlers, abetted by the army, erected a shed over the spring, renamed it Maayan Meir, after a late settler, and began driving away Palestinians who came to use the spring by force – at times throwing stones or even pointing guns at them, threatening to shoot. While residents of Nabi Saleh have already endured decades of continuous land grab and expulsion to allowfor the ever continuing expansion of the Halamish settlement, the takeover of the spring served as the last straw that lead to the beginning of the village’s grassroots protest campaign of weekly demonstrations in demand for the return of their lands. Protest in the tiny village enjoys the regular support of Palestinians from surrounding areas, as well as that of Israeli and international activists. Demonstrations in Nabi Saleh are also unique in the level of women participation in them, and the role they hold in all their aspects, including organizing. Such participation, which often also includes the participation of children reflects the village’s commitment to a truly popular grassroots mobilization, encompassing all segments of the community. The response of the Israeli military to the protests has been especially brutal and includes regularly laying complete siege on village every Friday, accompanied by the declaration of the entire village, including the built up area, as a closed military zone. Prior and during the demonstrations themselves, the army often completely occupies the village, in effect enforcing an undeclared curfew. 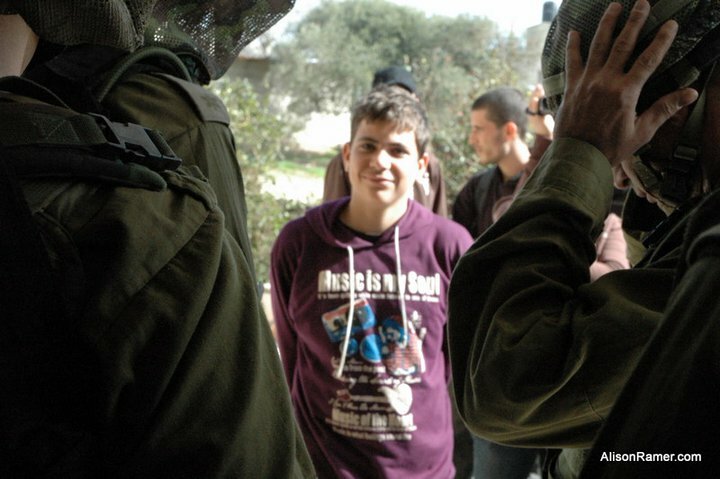 Military nighttime raids and arrest operations are also a common tactic in the army’s strategy of intimidation, often targeting minors. In order to prevent the villagers and their supporters from exercising their fundamental right to demonstrateand march to their lands, soldiers regularly use disproportional force against the unarmed protesters. The means utilized by the army to hinder demonstrations include, but are not limited to, the use of tear-gas projectiles, banned high-velocity tear-gas projectiles, rubber-coated bullets and, at times, even live ammunition. The use of banned 0.22″ munitions by snipers has also been recorded in Nabi Saleh. 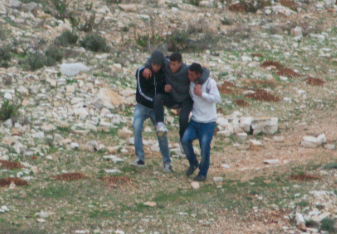 The use of such practices have already brought about the death of Mustafa Tamimi and caused countless injuries, several of them serious, including those of children – the most serious of which is that of 14 year-old Ehab Barghouthi, who was shot in the head with a rubber-coated bullet from short range on March 5th, 2010and laid comatose in the hospital for three weeks. Due to the wide-spread nature of the disproportionate use of force, the phenomenon cannot be attributed to the behavior of individual soldiers, and should be viewed as the execution of policy. Tear-gas, as well as a foul liquid called “The Skunk”, which is shot from a water cannon, is often used inside the built up area of the village, or even directly pointed into houses, in a way that allows no refuge for the uninvolved residents of the village, including children and the elderly. The interior of at least one house caught fire and was severely damaged after soldiers shot a tear-gas projectile through its windows. Since December 2009, when protest in the village was sparked, hundreds of demonstration-related injuries caused by disproportionate military violence have been recorded in Nabi Saleh. Between January 2010 and June 2012, the Israeli Army has carried 98 arrests of people detained for 24 hours or more on suspicions related to protest in the village of Nabi Saleh, including those of women and of children as young as 11 years old. Of the 98, 31 were minors. Dozens more were detained for shorter periods. Two of the village’s protest leaders – Bassem and Naji Tamimi – arrested on protest-organizing related charges, were recognized bythe European Union as human rights defenders. Bassem Tamimi was also declared a prisoner of conscience by Amnesty International. Catherine Ashton, the EU’s foreign policy chief, recently denounced his conviction by an Israeli military court and Human Rights Watch warned that he did not receive a fair trial. RAMALLAH (Ma’an) –Israeli forces closed the village of An-Nabi Saleh on Monday night, shutting down entrances with road blocks and restricting movement of residents, witnesses said. 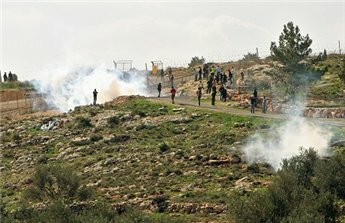 Israeli troops were deployed throughout the village for unknown reasons, leading to clashes with teenagers, witnesses said, . An Israeli military spokeswoman said there was no military activity in the area overnight. Military jeeps remained stationed at the entrances to the village well into Tuesday morning, local residents told Ma’an, saying they feared several pending home demolition orders were about to be executed. An-Nabi Saleh’s popular resistance committee, which organizes a weekly protest against continued land confiscations from the nearby settlement of Hallamish, called the overnight raid a “collective punishment.” The raids were attempts to weaken the resolve of the villagers, who continue to demand access to lands confiscated by illegal settlements, locals said. Bassem Tamimi, coordinator of the Nabi Saleh popular committee, was arrested when dozens of soldiers raided his house at noon today beating his wife and daughter in the process. Only yesterday the military court had ordered the indefinite remand of Naji Tamimi, another member of the Nabi Saleh population committee. Minutes after Bassem Tamimi entered his home to prepare for a meeting with foreign diplomats, dozens of Israeli soldiers stormed his house at the West Bank village of Nabi Saleh and arrested him. The soldiers tried to prevent Tamimi’s wife, Nariman Tamimi, from filming the arrest, hitting her and trying to grab the camera from her. When she passed the camera to her 10 year-old daughter, the soldiers grabbed it from her using violence and threw it outside in the mud. Naji Tamimi, member of the Nabi Saleh popular committee and one of the leading figures in the struggle against the annexation of village lands by the nearby settlement of Halamish, was arrested last night during an army night raid on the village. The military also searched the home of another popular committee member, Bassem Tamimi, absent at the time. These last few weeks saw the army waging an extensive arrest campaign against village residents, specifically targeting minors. On a sunny day people usually stand outside or sit in the direct sun in the waiting area at the Ofer military court. To observe a trail at Ofer, one must enter the facilities and, in a way, become a prisoner. Visiting diplomats and human rights officials alike, are allowed to bring only money and cigarettes into the court area. Trials are given times in two vague categories – before the lunch break and after. Often a trial is listed for ‘before the lunch break’ and so observers will arrive at the court around 9 a.m., only to find that it has been postponed until after the break, leaving the unlucky observers with five to six hours to kill in what is basically a large prison yard – buckled asphalt surrounded by watchtowers shaped like World War Two-era pillboxes, and chain link fences topped with rolls of barbed wire. Islam Tamimi, a 14 year old child from Nabi Saleh who was pulled out of his bed by invading soldiers at 3 a.m.three weeks ago, had a hearing yesterday regarding the details of his upcoming trial. In a crowded room full of human rights observers from Palestinian legal organizations and woman from the Israeli organizationMachsomWatch , Islam was brought before a judge. A child swimming in an adult prison uniform, Islam fidgeted as children often do when a lot of attention is focused on them. In the early morning hours of November, the 25th, a night raid took place in the village of An Nabi Saleh. The four Soldiers entered the village at about 2:30 am with two jeeps, searching the house of Bassem Tamimi. Asked for the reason of their coming they claimed “it was their job” to come on a nightly basis, due to the weekly demonstrations held in the village since December 2009. They searched the house, opening cupboards and spreading the family’s belongings on the floor, without looking for anything in particular or finding anything. The family and two internationals that were at that time present were asked for their passports and threatened. The soldiers refused to speak in English and Arabic, insisting on speaking Hebrew in spite of it not being understood by everyone. The military tried to stop the taking of any photos or videos of the incident. They left at about 3 am, but not without mocking the family and announcing they would “come every night” and cause further problems. It became clear that the soldiers target Bassem Tamimi because they consider him the main initiator of the weekly protests. It has not been the first night raid in the village.